Friends now you read more theory about VMware NSX and it’s time to learn Installation part of this product. Let’s discuss in detail about Step by step procedure how to deploy and configure Various NSX Components. Now you will think about this question – which Components? Is this not an Appliance (OVA/OVF) file? For any product installation we need to know Pre-requisites and below is the list for VMware NSX. A properly configured vCenter Server with at least one cluster. Register NSX Manager with the vCenter Server providing IP address and credentials and the NSX Manager instance connects to the vCenter Server system. 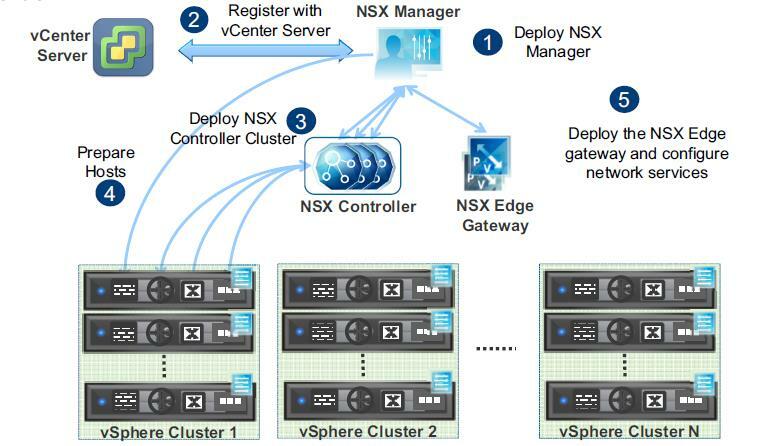 The NSX Managerinstance enables the NSX components in the VMware vSphere Web Client. The vSphere Web Client is used to deploy the NSX Controller instances through NSX Manager. After NSX Controller instances are deployed, hosts are prepared by using NSX Manager to install the VIBs on the ESXi hosts in the cluster. This is for today and in my next post I will provide Deploy NSX manager from OVF installation steps with screenshots.